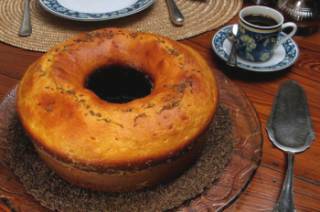 This cake is normally served plain, but may be served with powdered sugar and fruit. In Portugal, this cake can be made high like this one or as a thin sponge cake (jelly roll) with a chocolate or quince jam filling. If using a jelly roll pan, it needs to be greased and floured. Preheat oven to 325 degrees F/160 degrees C. Grease and flour the bottom only of a 9-inch tube pan. Beat egg yolks with the sugar until very light and lemon colored. Fold the egg whites and yolk mixture together in a very large bowl. Sift the flour with the baking powder and carefully fold into the egg mixture. Pour into prepared tube pan. Bake in preheated oven until done, about 80 minutes. Remove cake from oven and stand on rack upside down until cooled completely. Really nice soft sponge cake with no butter, so it was less fattening but quite sweet.